From the time my blog has come into being I have been wanting to post this recipe. But somehow I never got together to do it. A day before Onam, a friend of mine was casually speaking to me about Onam feast preparation and avial came into picture. She wanted to know how to make it and she just told me that she’ll look up my blog for the recipe and that’s when I had to tell her that I have not yet got a post on Avial. She was very surprised ‘cos, the name of my blog is Palakkad Chamayal, and avial is a very regular feature in a Palakkad Iyer’s Kitchen. So that’s when I decided it’s high time for me to post this specialty dish from Kerala. 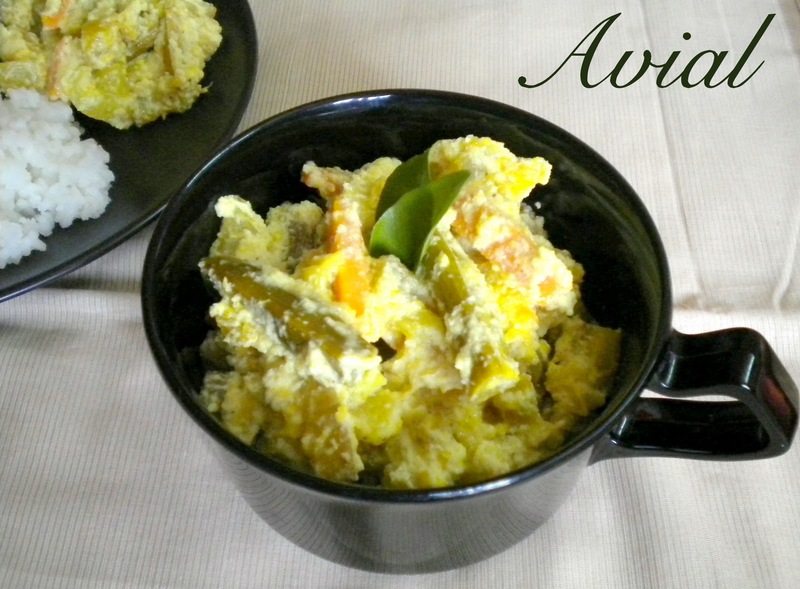 Avial is a yummy blend of different veggies in a spicy coconut and yoghurt gravy flavored with coconut oil. It makes use of vegetables like, Ashgourd, pumpkin, raw banana, yam, drumstick, yard long beans, snake gourd, carrots and French beans. Some people even add eggplants or brinjals. But I don’t add it. 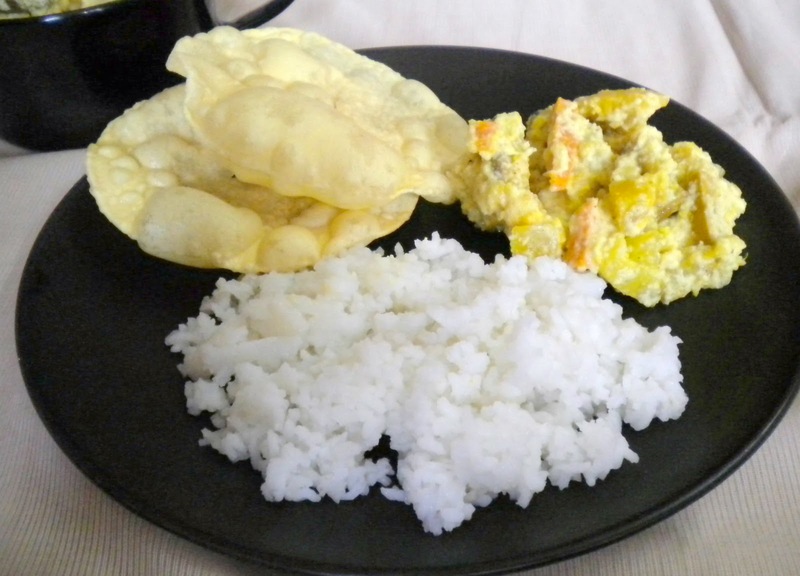 Some people prefer to substitute yoghurt with raw mango or tamarind pulp. Avial is made in two ways, one has more gravy and can be mixed with rice, just like Mor Kuzhambu, we call it Avial Kootan and the other is Gatti Avial, which is slightly thicker in consistency and acts more like a side dish for Sambar or Molagootal. Actually preparing avial has become a rarity at my place since we moved to Hyderabad. The reason being, that we find it very difficult to get ashgourd and pumpkin, which are one of the main ingredients in the local shops around our locality. So for this Onam, I made sure I got all the required vegetables from the raithu bazaar, and prepared it for our Onam Sadhya. A few months back, when I had gone to Trivandrum to visit my brother’s child, I happened to visit the Anantha Padmanabhaswamy Temple. My brother’s BIL, who is born and brought up at TVM, and is very attached to the temple took us to a guided tour of the temple. Then he narrated this incident about how avial came into being. The king of Travancore, conducted poojas, called Murajapam for a specified period of days, every year, in which a many vedic scholars participated. One year, it so happened that there were no vegetables left for the last day of the Murajapam. A small quantity of different vegetables left over from the previous days was available. So the head cook, used all these left over vegetables and prepared a dish and he named it avial, which means a combination of this and that. This dish was liked very much by the king and all. The cook was handsomely rewarded and avial became a regular fare in any feast. I have to mention here, that Adai is my Husband’s the most favorite dish. And he loves the combo of Adai with Avial. So whenever we have Avial for lunch, the dinner menu gets fixed immediately as Adai. This has become an unexpectedly long post. So now let’s just get to the recipe. Wash peel and cut all vegetables lengthwise into about 2” sized pieces. In a heavy bottom Kadai, add the Yam, plantains, ashgourd, at the bottom (since these veggies take slightly longer time to cook) and then add the other veggies. Add a pinch of turmeric powder and salt to taste. Add about 1 cup of water and cook covered until the vegetables are just done. They should not get mushy. If after the veggies get cooked there is lot of water remaining, cook uncovered till the moisture has almost dried up. In the meanwhile, grind fresh scraped coconuts with the green chillies into a fine paste using very little water. Add the ground paste and the slightly sour yoghurt. Mix slowly without mashing the vegetables. Add curry leaves and drizzle the coconut oil. Mix carefully until the veggies are coated with the coconut and yogurt. Remove from heat. Yummy gatti avial is ready. This can be used as a side dish for Sambar and rice or with Molagootal. Or as I mentioned with Adai. To make Avial Kootan, i.e aviyal of pouring consistency, use more of yoghurts and do not let the water evaporate while cooking the vegetables. This is best had with pappadms. If using raw mangoes, need not use yoghurt or just use a little bit of fresh yoghurt. Love avial so very much looks delectable,can't find those authentic kerala papadums here. Omg, wat a fabulous javial,seriously makes me hungry..
My all time fav veg dish..Looks yummy. awesome recipe dear....i love it as I can use lot of vegetables in it! Hey I dint know the story behind This yummy dish..:)..Avial looks super.. Finally my favorite avial. Looks so perfect and yummm!!! Wat an authentic dish, lovely dish looks super tempting..
loved the story behind how avial came in to being- nice post kaveri ! My all time favorite dish.Aviyal looks so tempting. 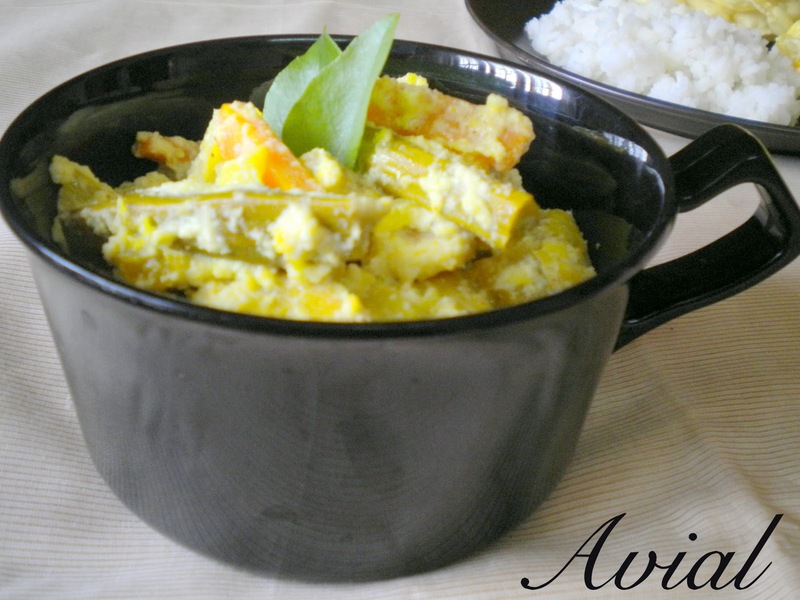 my fav dish, aviyal looks delicious, nice to knw abt the origin of the dish.. It is very healthy and tasty! It makes a great and filling side dish! Perfectly done.. Looks very tempting !! i have started a blog viz. rasavinsuvai.